What is a TIC vs. DST? 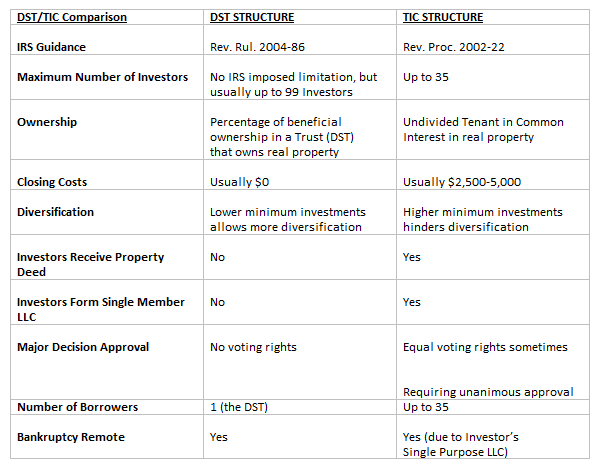 Typically, a DST is limited to 99 investors, and minimum investments are much lower than for a TIC. The DST will own 100 percent of the fee interest in the real estate and hold the deed to the property. Unlike a TIC program, the lender only needs to make one loan to one borrower, and the borrower is the Sponsor or an affiliate of the Sponsor. The investors will receive any potential distributions, appreciation and depreciation (tax shelter). Investors have no vote or say in operations of the property, as it is managed by the Trustee on their behalf. The lender does not need to underwrite any of the investors because they are totally isolated from the operation of the property.